Once again, its been a bit of time since I have last posted. Work and other things have intervened in workshop time again…and even more into my time to post here. Since I last posted, my son and I completed the “visible computer” project. It turned out very well and has met all of our expectations, and it was fun too. It has become my primary PC at home. I’ll probably build all of our computers from now on, rather than buy them. I like the control over the design that it gives, even without any price advantages…and it is not hard to do. After the completion of the PC, I went back to trying to complete the new point-to-point garden railway line in our backyard. As I noted in a previous post, I had installed all of the track and then tried to use an old analog LGB point-to-point electronic circuit to control the train. The device just would not operate properly, and I eventually decided that it was defective (it had not been out of the box in probably 7 years or more and so was way out of warranty). A little Internet research turned up a fellow tinkerer and a fascinating guy named Dave Bodnar, just on the other side of Pittsburgh, who is doing some amazing things with micro-controllers for garden trains. He recently published articles in Garden Railways Magazine and in LSOL.com on using these small, inexpensive programmable devices in railroading. He is a fan of the UK-based PICAXE-type controllers in particular. In his recent article for LSOL, Dave presented his new BARC (Basic Auto-Reverse Controller) point-to-point controller for G-scale trains. He explains how to build them if you like electronics, but he also will build them for you and sells them through his website www.trainelectronics.com. I have found Dave to be a wealth of knowledge that he freely provides, and he gives excellent support for his products too. While I wanted to build one, to save time I bought one of Dave’s for now. It works great! Far more features than the LGB model, easy installation and overall better design. I am very impressed. Dave has inspired me to try and build up my very limited knowledge of electronics, and I have read a few basic primers in recent weeks to scrape the rust off of the knowledge that I do have. I’ve added “learn to build with micro-controllers” to my ever growing list of future projects. I “helped” Dave to refine the design of his BARC a bit, by screwing up the first one that he sent me for him (I’m good at that). Apparently “electronically noisy” train engines (i.e., not well made) can cause electronic feedback to travel back along the rails and into the outputs from the BARC. This apparently can scramble the BARCs brains and ruin the unit. After some emailing with Dave, we determined that my Lionel brand G-scale Thomas the Tank Engine was causing such noise and had destroyed the first BARC. Dave immediately shipped me a new unit, and he has now added a small capacitor on the back of the BARC that will prevent this occurrence on his future models. The BARC now runs perfectly. You just can’t get that kind of support from a big manufacturer. That’s why I love working with fellow tinkerers whenever I can. I also added three of the perforated aluminum “tunnels” to the track where our plants threaten to overtake the rail line. I came up with this technique at our old railroad at the other house, and it worked great. 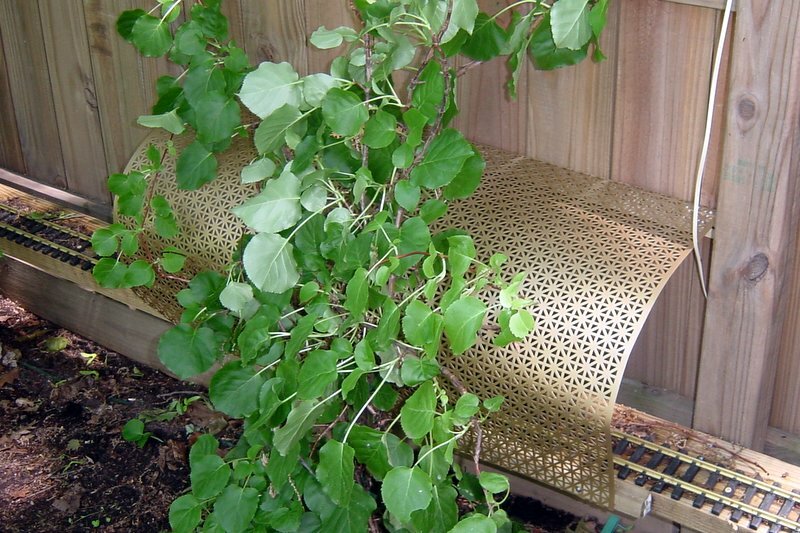 Just buy the approximately 3’x3′ decorative aluminum sheets that are sold by Home Depot as covers for old-fashioned hot-water heat radiators, and bend them into a tunnel shape and place them over the rail. The perforations in the aluminum (they come in many patterns and several colors) make the tunnels look very much like some kind of arboretum or station enclosure, and they will never rust. I will post photos here shortly. Posted on June 15, 2006, in Gadgets and Gizmos, Garden Trains. Bookmark the permalink. 6 Comments. Hi, Matt! That’s a beautiful box you made for your wife a couple of posts down! She’s a lucky one! I love your idea for the radiator cover tunnels–I’ll have to tell my husband about that one! Thank You! I am pleased with how the band saw box came out also. I will submit a post to you shortly! Thanks for your interest. Kids and trains are a great combination! Hi, Matt – I am pleased to see that the auto-reverse controller is working well for you – keep up your experimenting with the Picaxe – I think you will soon become addicted to tinkering with it! That’s all I need is another addiction!